Something Strange was originally published in 1988 by Marvel Comics under the Epic Comics imprint. Author Ann Nocenti has also worked on New Mutants and Uncanny X-Men as an editor, and created the Marvel characters Typhoid Mary, Blackheart, Longshot, Mojo, and Spiral. Artist John Bolton was one of the first British artists to work in the American comic book industry. He’s worked on some X-Men and Batman comics and collaborated with Clive Barker on the Hellraiser comics. The story does a wonderful job of capturing what it feels like to be an eight-to-ten year old, from the fear to the endless imagination. The brothers, Spike and Zebra, reminded me of the bond between myself and my sister – fighting each other one minute and playing together the next. Joy, the teenage punk rock girl, was a great character too – snarky and hateful at the world but with some vulnerability underneath. The story really takes off once the brothers decide to destroy the bogeyman once and for all so they can sleep at night, but I appreciated the beginning establishing section too. The only issue I had with the plot occurred at the end; there’s a big monologue about the banality of evil that I feel like I’ve read a hundred times before. I did like seeing hints of the personal darknesses that other children were experiencing. The artwork is absolutely stunning. At the beginning, before crossing over into “just a regular basement,” the art is almost photorealistic. As night falls and the characters cross into the bogyman’s land, the art and characters become surrealistic, colorful, and more than a bit disturbing. I probably spent more time poring over the artwork than reading the story, which isn’t necessarily a bad thing; the detail is superb, and there’s a lot of visual symbolism present. 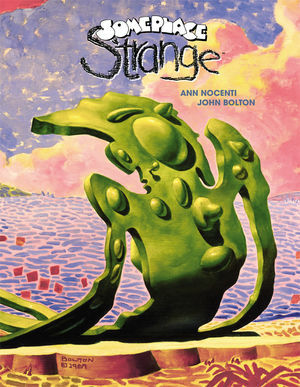 Pick up Someplace Strange if you like weird artwork and/or explorations of the nature of evil, especially through the eyes of children. Get the Someplace Strange full-color hardcover today (April 23) on Dark Horse or Amazon. Suggested retail price is $19.99, but Amazon has it for $13.65. It’s 83 pages.